Home Additions | Planning tips, types of additions, costs & more! Have you and your family outgrown your home? Opting for a home addition can be a great alternative to moving! You might even simply be looking to add a garage. Whether you plan on getting a sunroom, opt for some sort of bump out, add a garage or even get one with a room above it, we've gathered all the information you need to know for your addition renovation project. You'll find all there is to know in regards to planning, costs, inspiration, finding the right contractor for the job and more! Get a Renovation Advisor's help now! Receive up to 3 quotes! It's important to get any question you might have out before beginning a home addition project. For instance, you should consider the reason(s) as to why you've decided on a home addition. If you simply want to gain a little more free space in your kitchen, a simple layout change might make all the difference and you wouldn't need to undergo a home addition. Also, you'll need to see whether or not your land permits you to extend your home. A conventional house extension is typically a multi-room addition. Whether it be a lateral extension or extending your home into the backyard, they can essentially be done in the same way. Your home addition can be done on piles or on a foundation, all depending on your budget, and whether or not you'd like to have a bigger basement or crawlspace. Although these kinds of extensions are typically expensive, they have a great return on investment. Bump out home additions are great to add a little more space to your regular living space - whether it be to make your kitchen a little bigger or to enlarge your living room. Your bump out might end up just as big as adding an additional room to your home, but generally, a bump out addition is to simply add more square footage to existing space within your home. Sunroom additions are great. They add general living space to your home and let you enjoy beautiful sun rays. Keep in mind that there are many kinds of sunrooms out there. Is this addition one you plan on using year-round or only during warmer months? Depending on what your needs are, you can opt for a four- or three-season sunroom, a solarium, or even a screened porch. Each option out there requires a different amount of work, and, of course, sunroom costs will vary accordingly. Your home addition project might entail adding a second storey. 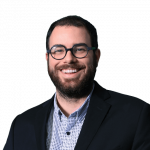 Perhaps you want to go ahead with this project so everyone has their own bedroom, or you might even convert your home into a bi-generational one by adding a second storey - like the Gilbert family. No matter the reason for your second storey addition, it's important to take a look at the cost of adding a second storey before planning something that's above your budget cap, as well as talking to professionals - like architects and structural engineers - to properly assess your reno project's feasibility. That's right! Adding a garage to your home is considered a home addition. Although you might not live in it, the garage will be used in some way or form. You might want one because you finally wanted to have a workshop where you can do some woodwork, or maybe as a place to store all your family's outdoor activity sets. In most cases, people opt to get a garage because they finally want a space to store their car when the weather outside is not so great. If you don't need a full-fledged garage for your home, you can also opt for a carport. Keep in mind that adding a functional garage to your home can also allow you to add a room above the garage and make your addition twice as functional. Of course, this will cost more, but it all depends on your needs and budget. Various garage costs might influence your final choice. If your home doesn't have a basement, you can opt to lift your home in order to add more living space. Whether you simply want more space, would like to add a bachelor, or turn your home into an inter-generational home, house lifting will surely increase your home's market value. However, this kind of addition is quite rare as its costs are fairly high in comparison to other home addition options. Opting to convert your attic is also an option. If the space is unused, why not? You can turn it into extra living space for everyone or even a bedroom. Ideally, your roof's slant should be at a 45° angle and the ceiling must be of at least 7 feet high for half the surface area. Of course, this excludes the physical ceiling materials and flooring. If ever your attic doesn't abide by these standards, you can always lift the roof to make space. This kind of addition is quite complex and will need the help of a structural engineer. Although costs may seem high, they are usually lesser than home extensions on a foundation. The cost of a home addition can vary according to many different factors. Will your home addition project be a turnkey project or will it be unfinished? Is the addition a lateral or a vertical one? Will it be on piles or on a foundation/concrete slab? Besides all the different materials you can choose, those are the main cost dictating factors. A sunroom addition might end up costing less than adding a room, but that will depend on the kind of sunroom you've opted for and the materials used. Your home addition can start anywhere around $120/sq.ft. and go up above $220/sq.ft.. Each project is different. Planning out your home addition isn't simply getting plans done and beginning the renovation process. There's a lot to consider. What exactly are you planning to add to your existing structure? Do you need to get permission from your city? Are you even allowed to follow through with the project? And much more. Each step of the process requires time and/or budget, so make sure you're ready for what's ahead. As mentioned above, there are so many details to consider when it comes to home additions. It's easy to get sidetracked and make mistakes that might end up costing you. The planning stage is crucial, so take the time to properly get it done. This way, you'll avoid making substantial mistakes during the process. You'll surely want your home addition to be started on the right foot. Note: omitting to consider the aforementioned planning steps is sure to put you in a home addition rut. Regardless of the type of renovation project, you plan on getting done at home, make sure you always audit each contractor you work with. When meeting with contractors, you should be asking them questions to be sure they know how to tackle the project at hand. This will ensure that you'll find the right one for the job. Home additions are no different than other home renovations, so be sure to properly audit your chosen home addition contractor too. At Reno-Assistance, each contractor we refer your way is 360° Verified to ensure you get the best results! 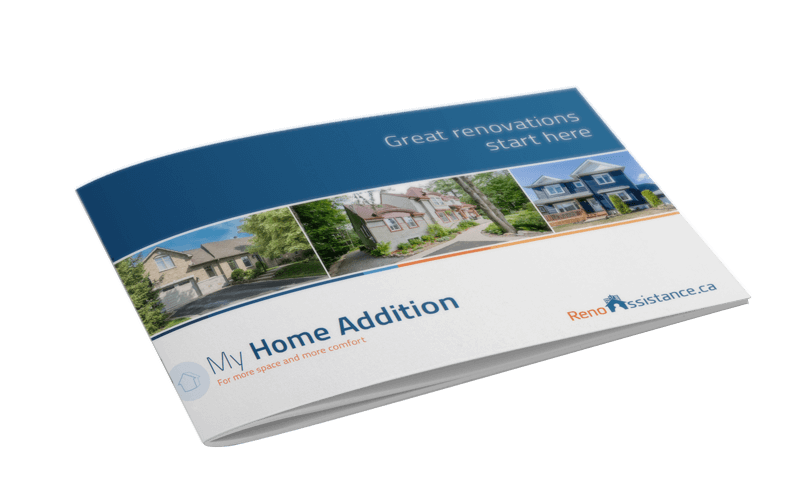 Get advice for your home reno project - it's free! When you contact us, one of our Renovation Advisors will take a look at your home addition plans with you and refer up to 3 contractors they believe to be best suited for the job. Our Advisors will also be there to take a look at the quotes you receive and help you make an informed decision when it comes time to pick one of the contractors. This service is at no cost, no obligation to you! Receiving quotes from top contractors easily done! Getting a fair price for your home addition project has never been easier! By getting in touch with us, you'll get competitive quotes from our home addition contractors relevant to your project. Our Renovation Advisor will be there to help you properly assess each quote you receive and explain to you what should be included, what isn't included, what you should ask to be changed, etc. Plan your home addition with our step-by-step guide today! 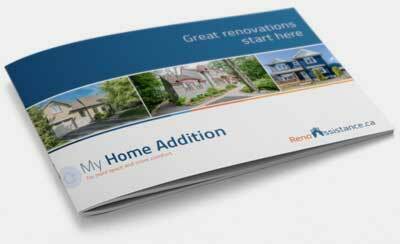 Download "My Home Addition" Today! so you can access it anytime!